CNG: The Coin Shop. BOEOTIA, Thebes. Circa 395 BC. 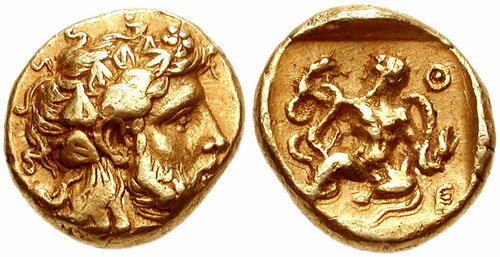 EL Hemidrachm (12mm, 3.02 g, 12h). BOEOTIA, Thebes. Circa 395 BC. EL Hemidrachm (12mm, 3.02 g, 12h). Bearded head of Dionysos right, wearing ivy wreath / The infant Herakles seated facing, strangling two serpents; all in incuse square. BCD Boiotia 470; SNG Copenhagen 302; Weber 3265 (same dies). Good VF, typical short flan. Very rare. Ex BCD Collection (not in Triton sale); Virgil M. Brand Collection (Part 3, Sotheby's, 9 June 1983), lot 75. These coins were probably struck with Persian gold (see Head, Boeotia p. 41). This is a rare opportunity for the advanced collector to acquire one of the two denominations of the only issue from Thebes (and the whole of Boiotia) in precious metal.